Relax and savor the moment as you feast on unbelievably delicious morsels of wagyu. Zen philosophy uses spring images of pink flowers and soft green willow branches to alert us to the wonders of nature and remind us to live each moment for what it is. That is the very sentiment behind the name and concept of Karyu. 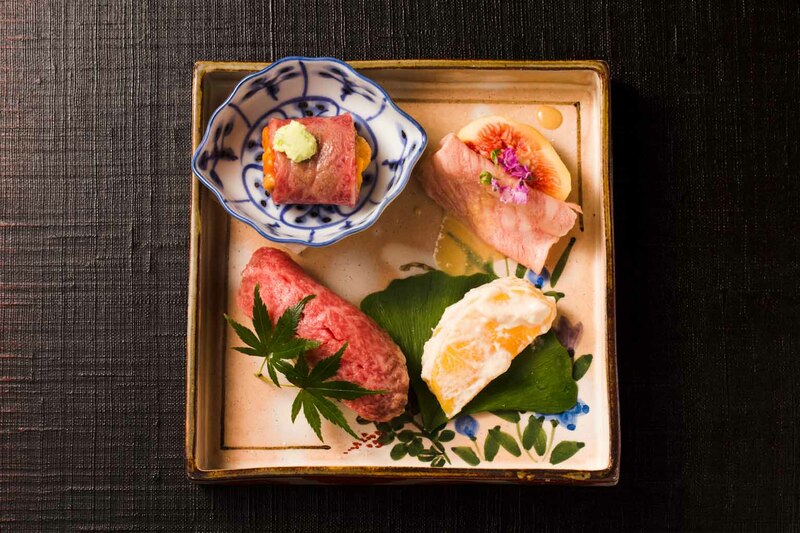 Here you can slow the pace right down and be treated to Japanese kaiseki focussed on wagyu, creatively prepared and served amongst an array of seasonal motifs and ingredients. With a brand new interior and name, there is a strong sense of unity about the furnishings, the concept and the chef’s passion for giving his customers the best. His many years of hard work and study are all culminating in his ideal space. It has a refreshing aura with the clean tones of unvarnished wood and touches of nature all around. 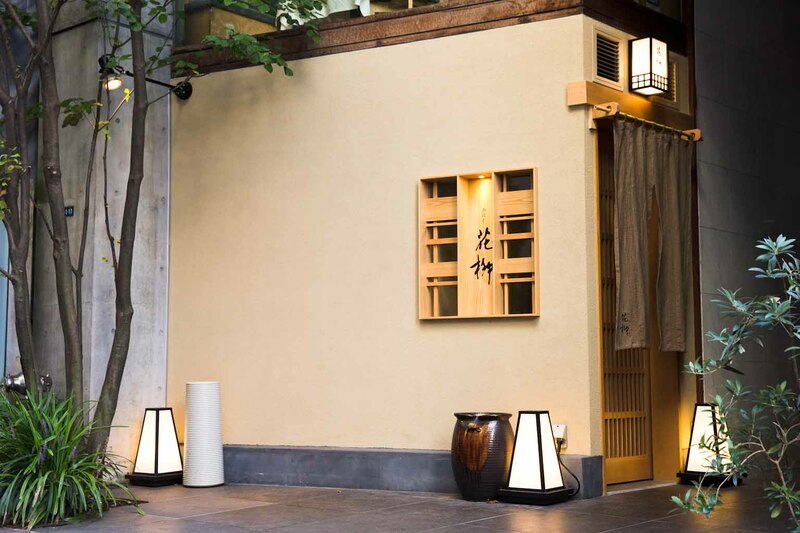 The seats are the very green of the willow tree, known for its relaxing qualities, and the wood design invites you to peek through the small window in the wall. 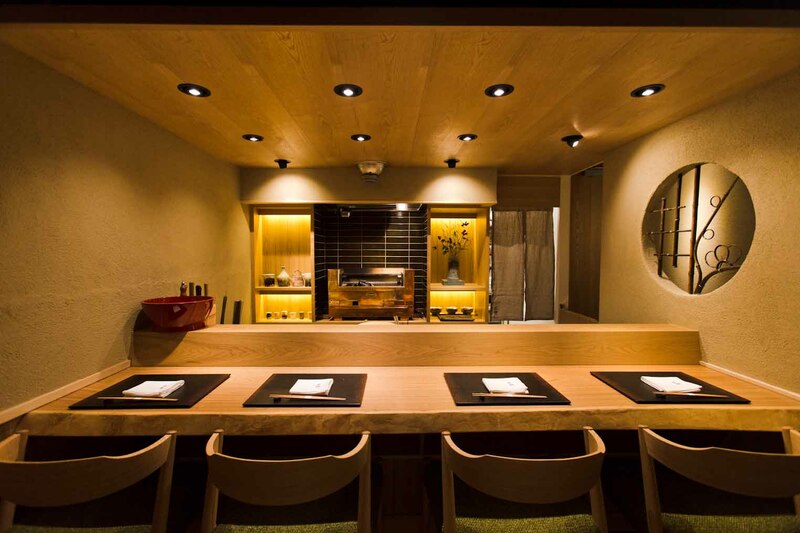 As you sit at the counter, you can admire the earthiness of the exquisite pottery, an intriguing ikebana flower display, and the gleaming copper case of the charcoal grill. Your senses are being stimulated from every direction. The restaurant seats a total of 16 at three tables and a four-seat counter. 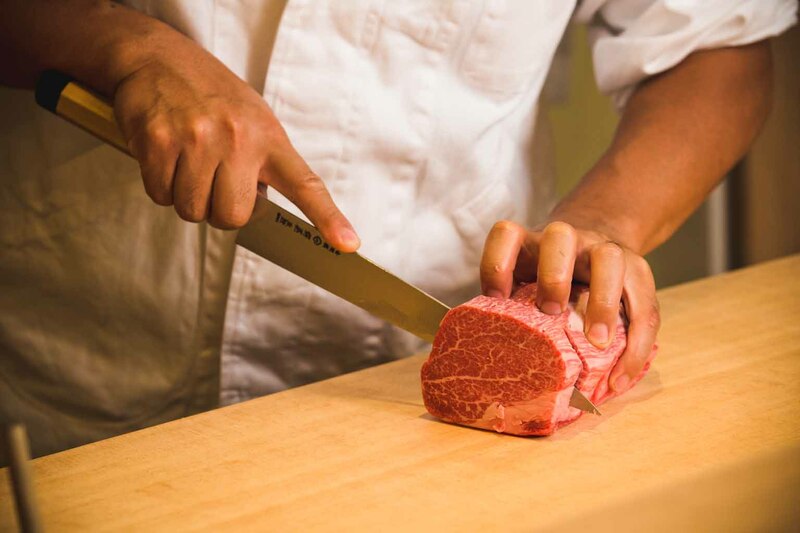 The prized counter seats are in fact front row seats to see the master cut, sear, boil, and charcoal grill the many elements of your meal, whetting your appetite as you watch. 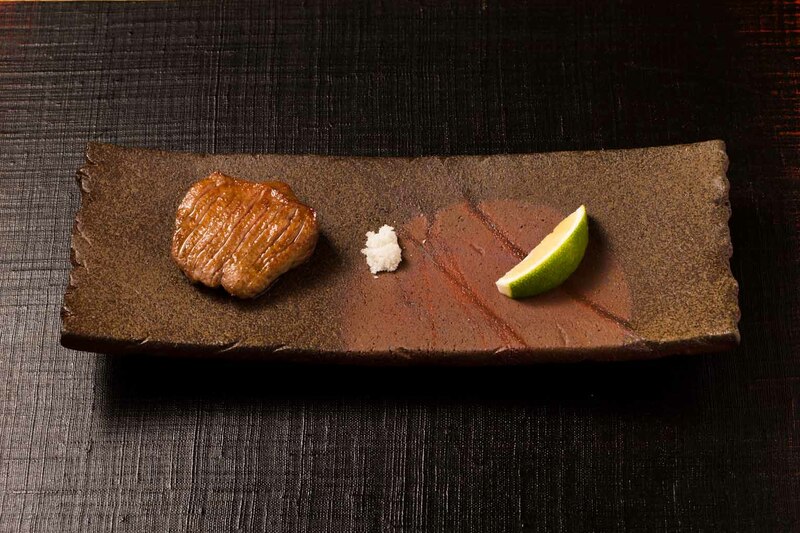 Find real WAGYU at Karyu. 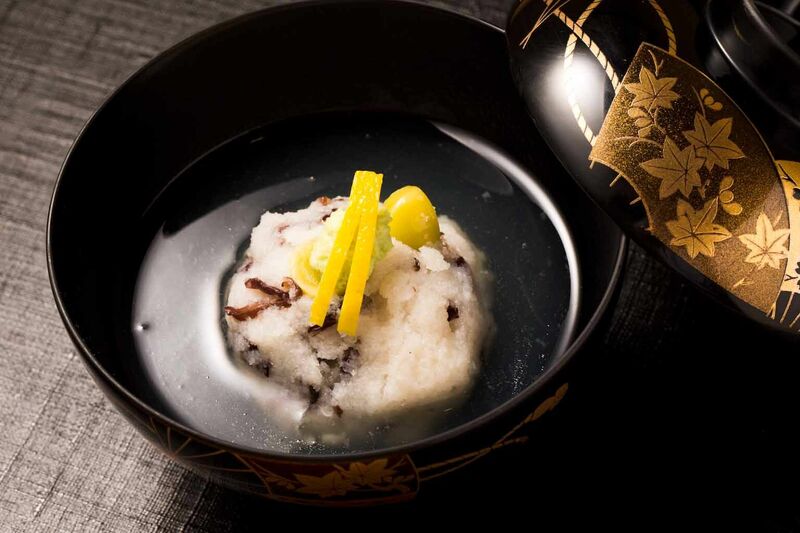 Japanese kaiseki cuisine always relies on the season for its inspiration, highlighting seasonal vegetables, mushrooms, nuts and fruits paired most commonly with a variety of seafood. 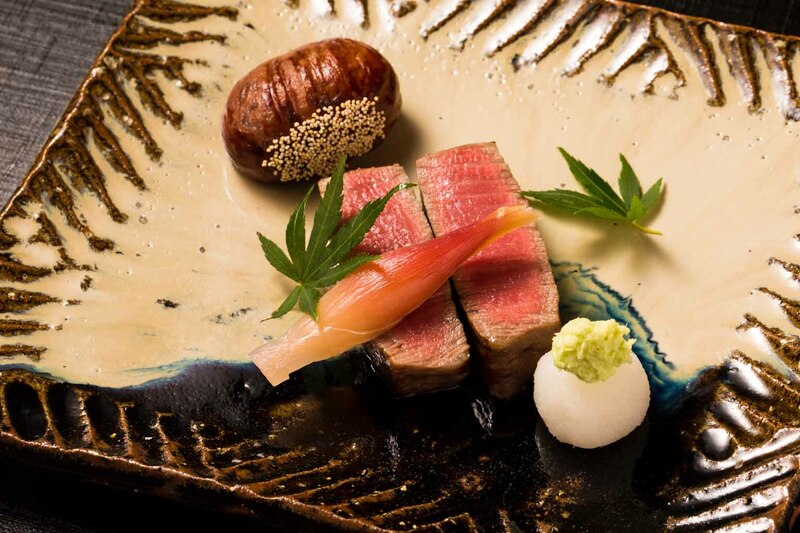 Chef Katayanagi has instead decided to use his knowledge of wagyu acquired throughout his career to showcase wagyu and its many parts, styles and cooking methods in a full course of wagyu kaiseki. He is constantly contemplating and designing new dishes that tempt and satisfy customers bellies without overwhelming them. The result has to be eaten to be appreciated. Alternating temperatures and textures, some dishes have a great deal of steps behind them to develop flavors; others are so simple with the premium ingredients speaking for themselves. The chef has mastered both, always with delicate touches of the season: for example, chestnuts, persimmons, and miniature green maple leaves remind guests that they are partaking in the rich bounties that autumn has to offer. Salivate as soon as you remove the lid from a small white pot that reveals a single portion of beef tongue stew to warm you from within, followed by an assortment of barely cooked wagyu pieces with seasonal ingredients like fig or persimmon, and lightly seared chuck wagyu wrapped around uni sea urchin roe with freshly grated wasabi – can you imagine a more luxurious morsel than that? 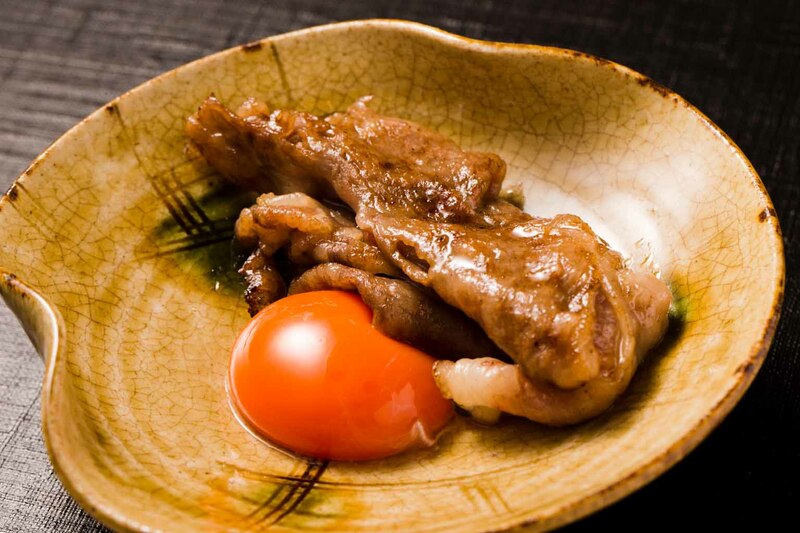 Next a creative roast beef dish in a creamy sauce, simmered thinly-sliced sukiyaki beef with the perfect golden egg yolk, and in a twist on the traditional dish of steamed grated turnip served with lily bulbs and gingko nuts in a delicate dashi, this one contains oxtail. After all this, you might ask what the finalé could possibly be…chateaubriand steak cooked to perfection and served ever so simply with wasabi and salt or ponzu. When you have had your fill of the beautiful and richly satisfying dishes, a comforting bowl of clay pot-cooked rice and accompaniments awaits you. Choose from the restaurant's wide selection of drinks to accompany your meal, including beers, both popular and rare shochu and sake, and glass and bottled wines from Japan and overseas. Katayanagi’s many years of working with wagyu mean he can view a piece of beef, guess where it has come from and gather some clues as to how it was raised. He makes sure butchers turn down all the signs containing information about the wagyu or brand when he goes in search of products, because his focus is purely on premium wagyu. There is no need for brand bias; he just wants quality wagyu. Even then he touches it, gets a feel for it and uses only the most delicious parts in the core for the best in flavor and texture. His wagyu suppliers, who he has established a relationship with over about eight years, are in various locations around Tokyo. He will go wherever he needs to in order to find the best product, including Tsukiji for deliciously fresh uni sea urchin roe. Haruka Katayanagi was raised in Tokyo. His father worked for a large Japanese advertising company but made a point of spending a lot of time with his family even taking them along to work events on weekends. That family mentality is ingrained in Katayanagi who is a father now. He talks about his own three children and how he feels so responsible for their upbringing. And this extends beyond his own family to his staff and their families too. This is a truly loyal and responsible man. Katayanagi’s first passion was music and during school he was a very active member of the wind instruments club. He later left university to pursue the role as percussionist in an orchestra, but injury caused him to abandon that dream. 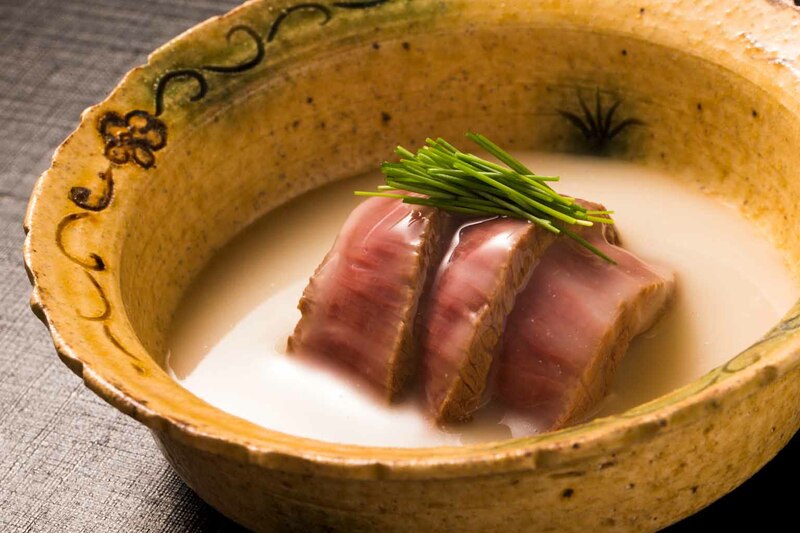 Katayanagi took up work in a prominent central Tokyo hotel and learned all the basics of Western-style cooking over five or six years before moving on to the largest wagyu restaurant group to further hone his skills and knowledge. 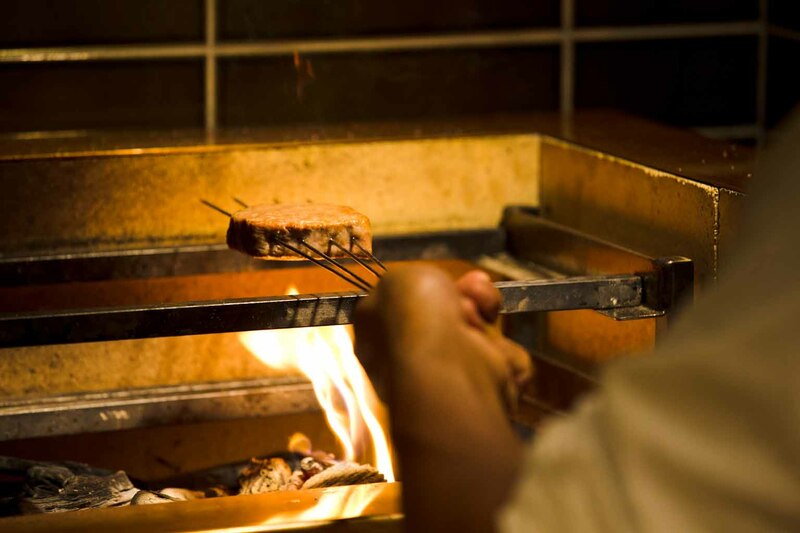 Then at the age of 26, he went independent establishing his charcoal grill restaurant at the site in Ningyocho where Karyu stands today. Over the last ten years, Katayanagi has grown and gone deeper into his work, pleasing many guests along the way, but he was still not satisfied with where he was. Not one to sit back contentedly, he wanted to challenge himself further. That is how he has now arrived at Karyu, newly reopened in October 2016. Chef Katayanagi is the first to admit that it is very difficult to keep the same quality everyday with the same intensity and passion. But that is his mission. Rather than expanding his business he wants to focus on his food and his customers, going deeper and deeper to achieve ever more delicious dishes, to satisfy new visitors and regulars alike. 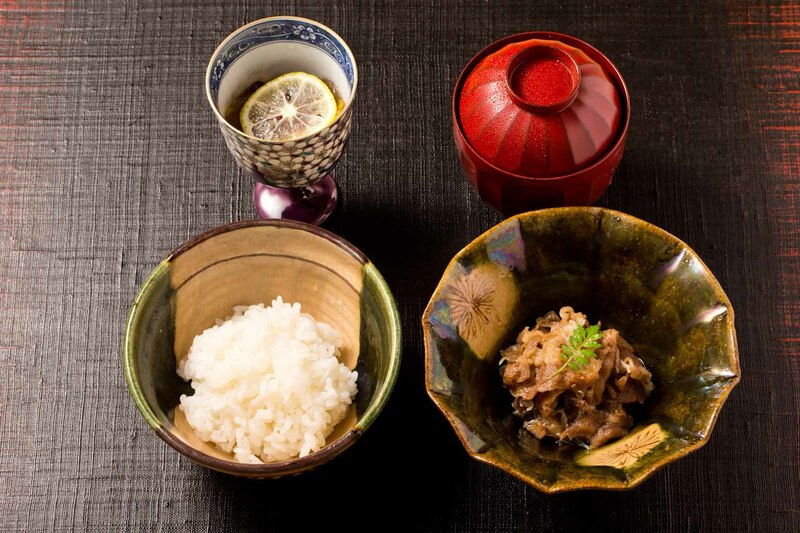 Katayanagi absolutely loves tableware and feels there is mutual respect between a chef and potters; he wants to uphold their incredibly skillful craftsmanship by serving amazing food on it. He personally chooses all his own pieces and his collection includes Shigaraki ware from Shiga Prefecture, Karatsu ware from Saga Prefecture and Bizen ware from Okayama Prefecture. He especially loves pieces by the highly respected potters and well-known kilns of Dohei Fujinoki and his son Yotaro (Karatsu), as well as Tomoya Amano (Bizen). Katayanagi visits the kilns in early summer to select his favorite pieces. 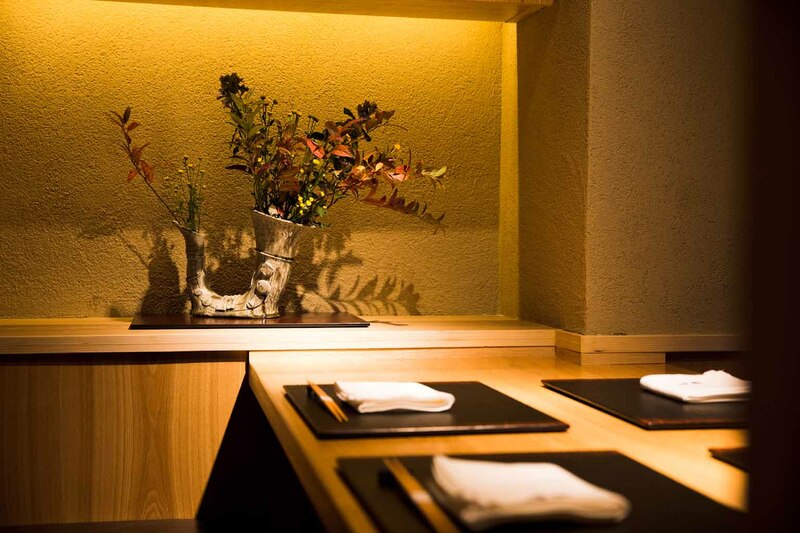 As you look around, you can see that the colors follow the same themes as the restaurant’s interior. Light and dark brown as well as greens – the colors and the pieces themselves simultaneously display strength and beauty. At once earthy and solid, yet given an almost feminine touch with a brush of green glaze or a delicate etching of flowers around the edge like a daisy chain. The sandy clay used in Shigaraki ware yields warm orange tones and firing in cave kilns achieves the mineral glaze surface for which it is so popular. 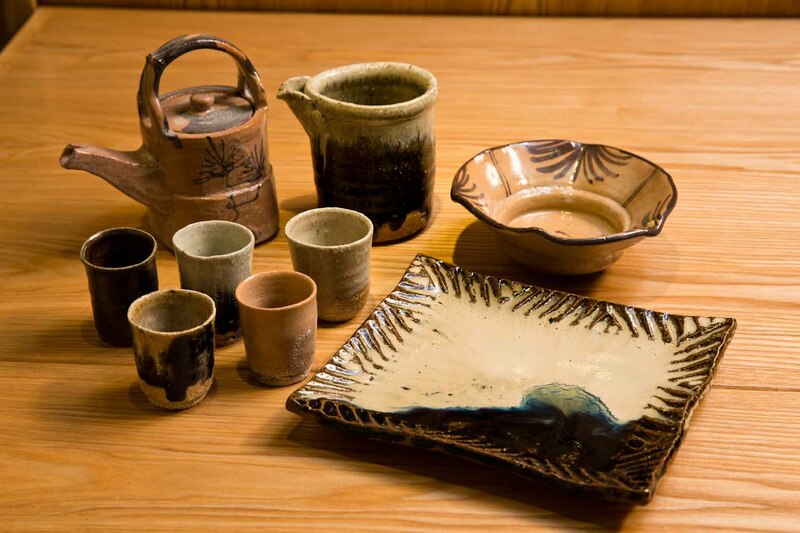 Karatsu ware, created in climbing kilns, is admired for its earthy and simple feel. Bizen is the oldest kiln in Japan and the wares are known for reddish brown clay and the lack of any glazes. Firing is relatively uncontrolled leaving much to nature resulting in surprising and incredibly beautiful colors and patterns that vary by location in the kiln and flame intensity. 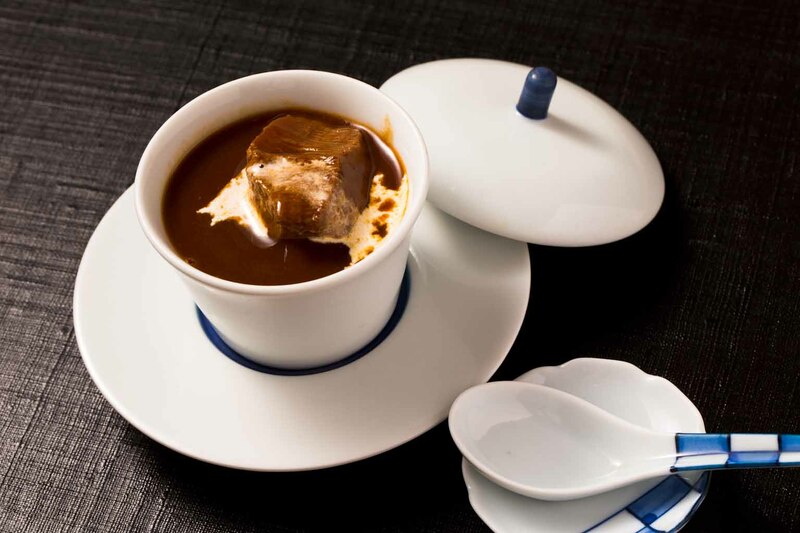 These ceramics are showcased throughout the restaurant and meal, with the addition of a fine collection of lacquerware for dishes in which the chef wants to maintain heat or wow customers with aromas as they remove the lid.